← Bradley Collection Celebrates 40th Anniversary! Jan Victors (Dutch, 1619–after 1676) was probably a student of the famous Dutch Golden Age artist Rembrandt (Dutch, 1606–1669). Just like his contemporaries, Victors created works with various popular subjects, including religious scenes, portraits, and genre paintings. The Milwaukee Art Museum has a market scene in its collection which falls into this last category. The Marriage Trap is set along the familiar canals of Holland. A peasant wedding party is purchasing a fish for the ensuing celebration. But the Dutch loved layering painting with many layers of symbolism–often for a humorous result. Victor’s ability in combining realism with humor is illustrated by the context and placement of the fish. It is most likely intended as a sexual metaphor! Recently, The Marriage Trap was on our list for submission to the Art Loss Register. A quick look at the thick object file—where we keep records and correspondence related to one artwork—showed me that there was some untangling to do! So, I carefully read through everything, looked for more resources, and double checked it all before organizing it in a clearly stated entry for our collection database. The most recent owner is well-known to us. The painting was given to the Milwaukee Art Museum in 1974 by Richard and Erna Flagg. The Flaggs also gave the Museum two world-renowned collections: Renaissance decorative arts and sculpture and Hatian art. At the time of the donation, the painting was attributed to Jan Sieberechts (Flemish, 1627–ca. 1700), who painted landscapes in the Italian style. A comparison with examples of his work at the Tate or the National Gallery in London shows that The Marriage Trap was not by the same artist. The painting’s current attribution to Jan Victors was made in 1977. That summer, two experts in Dutch art independently made the same call. The first was Seymour Slive, director of the Fogg Art Museum at Harvard University. The second was Julius Held of Barnard College. The attribution to Victors was published by Werner Sumowski in the six volume catalogue Gemälde der Rembrandt-Schüler (Paintings of the Rembrandt School). Published in 1983, this invaluable resource lists the paintings by 99 artists who worked at the time of or shortly after the time of Rembrandt. In 1985, Debra Miller echoed the attribution when researching her Ph.D. dissertation on Jan Victors. Jan Victors (Dutch, 1619-after 1676), The Greengrocer’s Shop De Buyskool, 1654. Oil on canvas. Rijksmuseum, Amsterdam, Purchased with the support of the Vereninging Rembrandt, SK-A-2345. Comparing The Marriage Trap to other paintings by Jan Victors shows why this attribution makes sense. 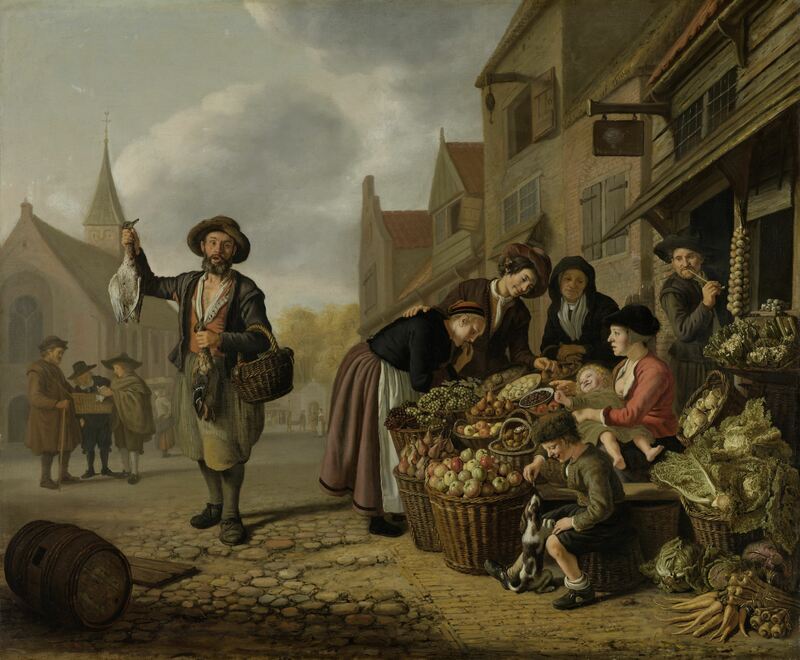 Take, for instance, a Village Scene with Cobbler at the National Gallery, London or The Greengrocer’s Shop De Buyskool at the Rijksmuseum in Amsterdam (right). Victors tended to use a linear style and a particular color palette. His genre subjects are full of details to the point of almost looking cluttered. The figures are solidly built and use emphatic gestures. On top of all that, Victors painted the fishmonger theme a number of times, another point for the attribution of the painting here in Milwaukee. By now, you might be asking, why spend so much time on the attribution of the painting when we are looking for the provenance? This is because paintings are often re-attributed to different Old Masters artists over time. It’s crucial to know the timing and reasoning behind any changes, to both fully understand the painting and to look for more information in the right places. After all, if we didn’t know that the attributed to Victors occurred in the 1970s, we might search earlier records only for paintings by Victors–thus making our research inaccurate. The same caveat applies to the title of an artwork. 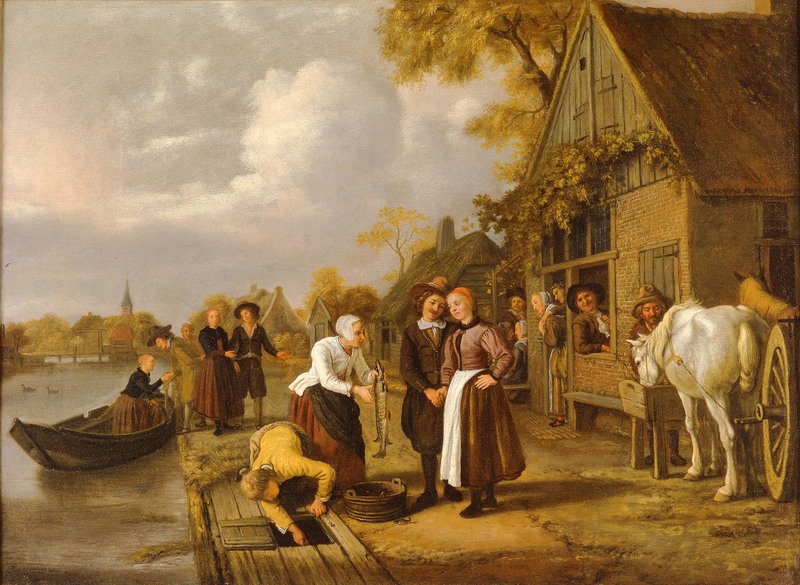 Over time, this painting has been known as The Marriage Trap; Village Scene; Village Scene with a Fishmonger; Fischverkäuf; and Der Fischverkäufer auf dem Dorf. But don’t worry, my research didn’t stop there. Stay tuned for Part 2 of this series for my discoveries about the ownership history of The Marriage Trap! This entry was posted in Art, Behind the Scenes, Curatorial and tagged attribution, Collection, Dutch art, jan victors, provenance. Bookmark the permalink. Quite an interesting research Catherine. The history of the ‘Marriage trap’ seems very interesting to read. Especially the symbolism and style of Jan Victors that is a blend of realism with humour makes his art collections unique. I will be looking forward to the next part of this series.